A rocket engine produces thrust by expanding combustion gases against the walls of a nozzle. Conventional rocket engine thrust chambers surround these gases in a bell-shaped nozzle. The shape of this nozzle and the ambient air pressure (atmospheric pressure outside the nozzle) influences the extent to which the gases can be expanded, and a rocket engine produces its maximum thrust when the pressure of the exhaust gases is equal to the ambient air pressure. Because the ambient air pressure decreases with increasing altitude, a conventional rocket engine is efficient at only one particular altitude; the specific altitude at which the engine is most efficient depends upon the nozzle's shape. A conventional bell nozzle is a compromise: At altitudes for which the nozzle is not specifically tuned, efficiency is lost because the gases are over-expanded with respect to the ambient air pressure (at lower altitudes) or under-expanded (at higher altitudes). A first-stage engine such as an F-1 or an H-1 is optimized for pressures near sea level, while an upper-stage engine such as a J-2 or an RL10 is optimized for higher altitudes or even a vacuum. The effect of the ambient air pressure can be seen in Saturn V launch photos: At lower altitudes, the exhaust plume is tightly constrained (only about as wide as the rocket itself) by ambient air pressure, while at higher altitudes the exhaust continues to expand outside the engine's nozzle, to many times wider than the rocket, indicating that the gases are under-expanded. In an aerospike engine, the nozzle is "turned inside out", with gases being expanded against a nozzle wall on one side and ambient air pressure on the other. Since the aerospike engine has no outer wall, the exhaust is always expanded to ambient conditions and does not suffer performance losses due to atmospheric pressure at different altitudes as does a bell nozzle; this is referred to as "altitude compensation." An aerospike usually results in a smaller and lighter engine as compared to a bell-shaped engine, providing additional benefit to the launch vehicle. An aerospike engine usually consists of a number of small combustion chambers (sometimes called thrusters) at the forward end of the engine. The thrusters' exit planes are aimed at an angle against the engine's nozzle ramp. Aerospikes can be constructed with a round (usually called annular or torroidal) nozzle ramp, with the thrusters position around the periphery of the ramp, or with two straight, parallel nozzle ramps (usually called a linear aerospike). By differentially throttling the thrusters, full roll, pitch, and yaw control can be effected. By obviating the need for gimbals and the associated hydraulics and propellant flex lines normally required for attitude control, propulsion system weight is further reduced. Rocketdyne experimented with annular aerospike engines (including the J-2T—for "torroidal"—which was intended to be a drop-in replacement for the standard J-2 in the Saturn series of rockets) in the mid- to late 1960s. Rocketdyne even considered submitting such an engine in the competition for the Space Shuttle Main Engine. However, in October 1969 and again in July 1970 NASA issued statements indicating that they expected the engine to be chosen for the SSME program to be a "bell-type engine" with a staged combustion cycle, so Rocketdyne turned its attention to developing a more conventional engine and produced the engine which would eventually become the SSME. Photos of Rocketdyne's annular aerospike engine undergoing a hot-fire is available from Alternate Wars; do a search for "NASA/USAF Advanced Development Program (ADP) Aerospike Engine" and scroll down to the bottom of that section. Although no longer pursued for the SSME, Rocketdyne continued its development on the aerospike concept, producing and test-firing two linear aerospike engines in the early 1970s. Called the "Linear Test Bed" engines, the program started in April 1970 when MSFC's Saturn System Office authorized the work. Research using Linear Test Bed No. 1 concluded in May or June 1972 (depending upon the source) after 44 successful tests; the Linear Test Bed No. 2 work concluded in October 1973 after 29 successful tests. Never intended for flight, these engines were constructed of heavy, inexpensive materials and used turbopumps from the 1960s-era J-2S program. 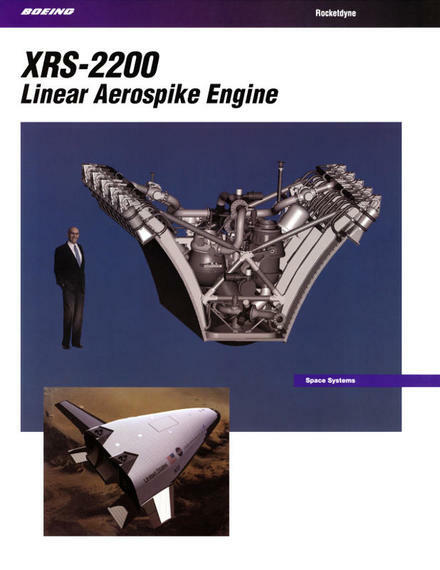 Many of the photos and videos available online showing the hot-firing of a linear aerospike engine are of the Linear Test Bed engines (including some photos purported to be of the XRS-2200); the Linear Test Bed engine can be identified as having a wider base than the XRS-2200. Oddly enough, even the Rocketdyne RS-2200 and XRS-2200 fact sheets below both include a photo of a Linear Test Bed Engine hot-fire test. Additional information about the Linear Test Bed program can be found in the Linear Test Bed Final Report, Volume I: Test Bed No. 1 and Linear Test Bed Final Report, Volume II: Test Bed No. 2 reports and The Linear Test Bed Program video. Rocketdyne resumed work on the linear aerospike in the mid 1990s for the proposed VentureStar single-stage-to-orbit spaceplane, offering an engine called the RS-2200. Although neither the VentureStar nor the RS-2200 were ever constructed, subscale technology demonstrator versions of both were commissioned as the X-33 and the XRS-2200. Although the X-33 was never fully completed, Rocketdyne built and tested two XRS-2200 engines. The XRS-2200 engines were tested individually and installed end-to-end, forming one larger engine. NASA has an "X-33 Reusable Launch Vehicle" page which focuses on the XRS-2200; be sure to see the X-33 Dual Engine during Assembly (Top View) photo, a top view of the engine with its turbopumps, engine control systems, and gas generator. 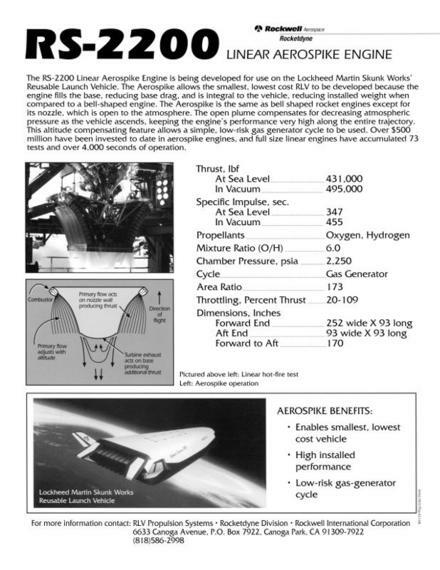 NASA also has a fact sheet on the X-33's linear aerospike engine. Spaceflight Now has a large number of news releases dating to the period of the XRS-2200 testing. The X-33/VentureStar program was cancelled in 2001 after the X-33 ran into fabrication difficulties, no additional projects expressed an interest in the RS-2200 or linear aerospike, and no engine hardware ever reached production status. One of the XRS-2200s technology demonstrator engines is on display in Marshall Space Flight Center's Propulsion Park and the other is displayed at the INFINITY Science Center. General background information about aerospike engines, including the theory of operation, can be found in this YouTube video. A hot-fire test of a pair of XRS-2200s can be seen in this YouTube video, in glorious 240p (it was the late 1990s, after all). 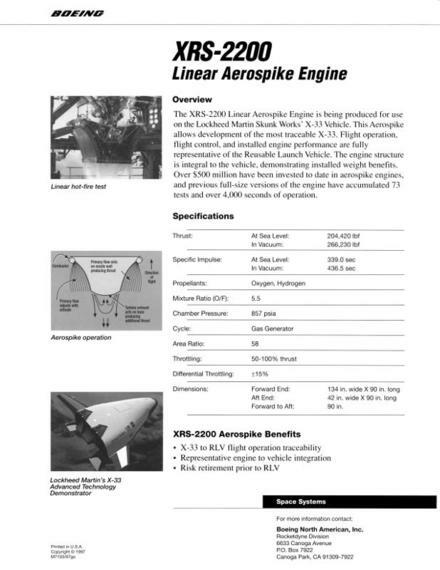 "The Control System for the X-33 Linear Aerospike Engine"
"Aerospike Engine Control System Features and Performance"
I have scans of data sheets for the RS-2200 and XRS-2200 linear aerospike engines. The specs on the data sheets show that the RS-2200 version of the engine would have been approximately twice the size and would have had twice the thrust of the XRS-2200. The VentureStar would have sported seven of the RS-2200s, while the X-33, as a suborbital technology demonstrator, was intended to have only two XRS-2200s. The XRS-2200 data sheet is dated 1997. 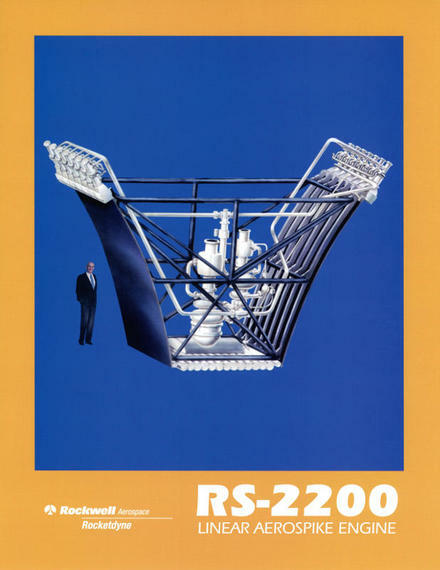 The RS-2200 data sheet is undated, but was published by Rockwell International, so it would seem to pre-date Boeing's 1996 acquisition of Rockwell. Both of the data sheets feature photos of a 1970s-era Linear Test Bed engine hot fire. A web-resolution PDF for the casual visitor; 760 kilobytes. View now. A 600-dpi version suitable for printing your own copy; 11.7 megabytes. Download now. A web-resolution PDF for the casual visitor; 1.2 megabytes. View now. A 600-dpi version suitable for printing your own copy; 30.2 megabytes. Download now.